In Florida, Cubans were about twice as likely as non-Cuban Latinos to vote for Donald Trump. More than half (54%) supported the Republican president-elect, compared with about a quarter (26%) of non-Cuban Latinos, according to National Election Pool exit poll data. A significant share of Cubans in Florida voted for Hillary Clinton – 41% – but this was far below the 71% of non-Cuban Latinos who backed the Democratic nominee. 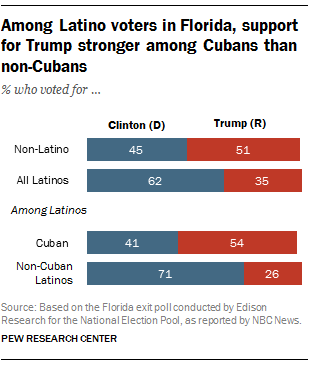 At the same time, the level of support for Trump among Cubans was similar to that of non-Latinos in the state (51%). Overall, 35% of Latino voters in Florida supported Trump, but that share was down from 2012, when Mitt Romney won 39% of their vote. Florida was once again a battleground state this year, which focused attention from the campaigns and nonpartisan groups on the Latino vote statewide. As a result, Latino turnout was up among early voters, according to news reports. And the Florida exit poll shows the share of the state’s voters who were Latino grew from 17% in 2012 to 18% in 2016. While there is no exit poll data that shows how Cubans in Florida voted in 2008 or 2012, our National Survey of Latinos has found that Cuban registered voters have been shifting toward the Democratic Party for more than a decade.